Kilmore Heights is an exceptional barn conversion set in a beautiful private location in South Ayrshire with fine south facing views over unspoilt rolling countryside and the River Doon. 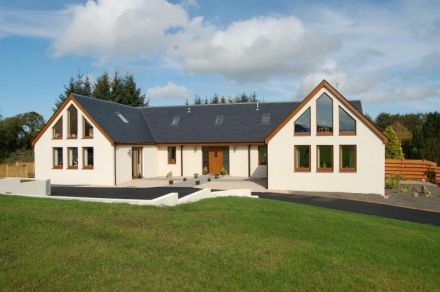 Quietly situated between Hollybush and Dalrymple, this impressive architect designed south facing 3,000 sq ft barn conversion was completed to a high standard in September 2010 under architect supervision. Providing extensive accommodation, underfloor heating and all the insulation benefits of a new house built to modern building standards such as oak floors, doors, skirtings and an attractive bespoke oak and glass staircase, this family home offers an impressive open plan sitting room and kitchen, formal lounge, study/bedroom 4 and shower room on the ground floor. On the first floor there are two impressive suites each with large bedroom, en-suite bathroom and individual sitting room with south facing views. There is a beautiful master bedroom suite on the ground floor overlooking the private gardens. In addition there are two acres of landscaped lawns and grounds, an excellent portal frame general purpose building (12m x 6m with an eaves height of 4m) with concrete floor and a roller shutter lockable door, with power. This is an excellent facility for a wide range of different uses including workshop and garage. Fishing is available on the nearby River Doon which has some of South West Scotland's best salmon and trout fishing. The house is within the South Ayrshire school catchment areas. Hollybush is a popular small hamlet with well regarded local Inn about 10 minutes from Ayr town centre which has a wide range of excellent services including cinema, shops and excellent private and state schools. There is a main line railway station in Ayr with regular services to Glasgow and beyond. Prestwick Airport with international flights is within 10 miles. Glasgow can be reached by road by the A77/M77 in a journey time of about 50 minutes.